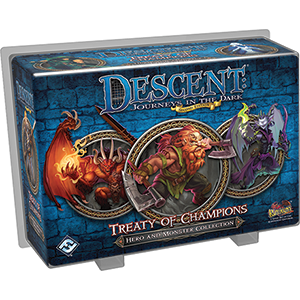 Join your fellow heroes to battle an ancient demon in the Treaty of Champions Hero and Monster Collection for Descent: Journeys in the Dark! Four heroes unite to defeat this deadly threat, while the overlord player gains ten monster figures, including the brand-new crow hags, which enter Descent for the first time in this expansion. Two new quests, Sindaea’s Secret and Treaty of Champions, chronicle the heroes’ struggle to bind a powerful demon and stop an ancient evil from reappearing. Become a champion and save Terrinoth in this Hero and Monster Collection! This collection requires a copy of Descent: Journeys in the Dark Second Edition to play.